Thanks for the patience, amigos. The last few weeks we've been doing three articles per but that's NOT the new norm by any stretch. If I'd a known about the circumstances when doing the Patreon drive I'd have held off, trust me. But just the same please accept my heartfelt thanks. Sodo Mojo revisits the 2018 trade deadline for us. They cut it as fine as re-evaluating the Tuivailala-for-Elledge deal, go through Duke and Warren and Maybin. Sodo Mojo swoons at the five games Tui pitched before tearing his Achilles', and calls him a major asset going forward with his 4 years of club control. Their grade at the time A-; their new grade B. They gave Zach Duke a B at the time, revising it to D- now. In case you don't want to look it up, here's his statline with the M's: 5.3 K, 4.5 BB, 0.8 HR. But in his last 18 games he's given up 1 run, a .147/.275/.206 (!) slash line, and the M's are 12-6 in those appearances. Mojo doesn't care for his record vs. LHB's (.226/.293/.333 on the year) and calls into question Dipoto's ability to provide a real LOOGY for Servais to deploy. Adam Warren got a A at the time and gets a D now. :- ) In 19 innings, he's racked up 5.7 K, 3.8 BB and 0.9 HR. Comment: his lifetime standard is more like 8.0 / 3.0 / 0.9 and they need to get him right. He'll be in the mix come March. Duke on the other hand is a true LOOGY, with a piddling 5.6 lifetime K rate and no hair-fine BB rate to compensate, so if he can't come in and get one lefty there's no point. Cameron Maybin they gave a C at the time and an F- now. If you lost interest in the Mariners some time ago, and shame on you if you did not, you lost track of his .202/.256/.274 slash line. Not included in the article's summary is Dipoto's trade of Adam Moore for Denard Span (116 OPS+) and Alex Colome (results: scintillating; attitude: boggling). I didn't know that a reliever could get 3.5 WAR. Edwin Diaz did ... that is, he did know, and he did do it. This tied him with James Paxton for the team lead. I mean, I sort of knew you could get 3.5 WAR as a closer, but Mariano Rivera never did. He got 4.3 one year setting up Wetteland and throwing 107 innings, but much more to the point, Mo averaged only 2.09 WAR per season in his career. Think about that a minnit. In a 19-year career as closer, Mo got 3.2 WAR twice as his highwater marks. Excluding the one setup year. Aside from that he never hit 3 WAR in a season. Diaz had 15.1 K, a miniscule 2.02 BB, and 0.63 HR. That's what I call a piece to build around. 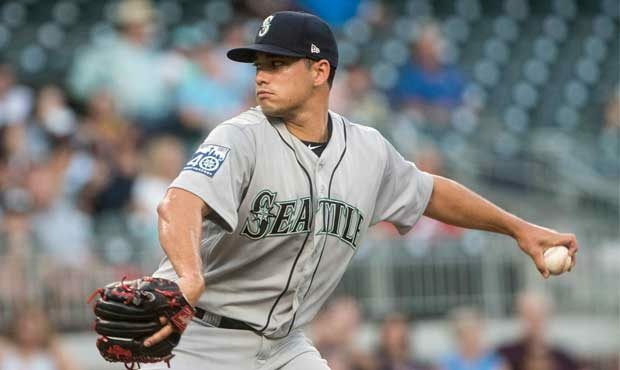 Speaking of a piece to build around, Marco Gonzales also pitched -- pitched I sez -- his way to 3.3 WAR this year, only 0.2 less than Paxton. Want to hear the funnier part? That's despite the same number of innings, 150 to 161. In terms of slash lines, Marc-O was 7.7 / 1.7 / 0.9 and as long as he replicates these outcomes, he is a fully viable #2 starter. Throwing for club-controls money. I just like him. I like guys who think while they compete. I like guys who went to small schools. I like guys who battle. I like the fact that he came up with Seattle (you know what I mean; Randy Johnson "came up with Seattle" in my mind). Megakudos to Bat571. is 4.2. We wuz good. They wuz better. The M's are above AL average in OPS (103, lg avg 100). But they are a more than a third of a run below AL average in scoring (4.17, lg avg 4.51). The M's have been poor at taking advantage of what hitting attack they mounted. That will always underperform expectations in RS...when you get your ops+ with slg, I mean. The M's were 11th of 15 in the AL in OPS, far from above average. 20th of 30 in MLB. Their low OPS is exactly why they underperformed. They were missing a capable LF and 1B which dragged the team down. Their team OBP of .314 is below the league average of .318. 4.06, sixth best, and ahead of the A’s 4.17. League average was 4.23. Zunino extended to three years his resurgent bat vs. RHP. His first three MLB seasons saw vR OPS numbers of .609, .632, .534; his last three have been .769, .827, .720. However, if you don't count his annus horribilis season of '15 (.522), then his .594 OPS vs. LHP in '18 has been the worst of his career. This year, he's actually struck out more frequently (39%) vs. LHP than he has RHP (36%). Please tell me why Servais pinch-hit Healy for Vogs (who already had one of our three hits), leading off the 8th innings last night, with Connor Sadzeck, a RHP, now on the mound. Maybe I missed it during the commercial break and Healy was announced before the pitching change....but all the same it wasn't really "playing the percentages." Healy's .265 OBP vL this season tells part that story? His smoking-hot bat, of late; .179-.263-.209 over the last 28 days, tells most of the rest. The fact that Wak just might respond with a pitching change (although unneeded: see above) finishes the story. Healy is 2-9 vs. Moore for his career, 0 BB's, 2 K's, 1 HR. Well, in the past 2 weeks, the M's have been passed by the Rockies, Dodgers, Cardinals and the Rays in the overall standings... so if he has been told to go for the draft choices, Servais is doing a good job. Evidently Servais said Segura was taken out of game in third because he didn't run hard on play at plate in seven-run second and he wants team playing hard to finish. Segura benches self once or twice. Segura and Gordon play Rock 'em, Sock 'em Robots. Segura, hitting .300+, is removed in Game 160 for not running hard. Didn't see the play? Any of you SSI'ers? Moe... with 2 outs and bases loaded, Segura hit an opposite field high flyball to the edge of the grass / track that the Texas OF took very casually... and let graze off the top of his glove to bounce around on the track and wall. Haniger easily scored from 1st base, but Segura is seen coasting into 2nd base as the throw misses the cut off man. I think Cano, and many others on THIS M's team would have done the EXACT same thing. My guess is someone has been complaining about the lack of hustle for a while (Gordon?, management? ), and Servais finally decided to do something... but again THIS team has done much worse many times over the past couple of years. Segura banished to the corner stool today. Gordon out, too. Cano sits. Somehow I get the sense that Servais has lost control. Any whiff of that out there? We finished last in the division in scoring--by 44 runs. Healy 91 OPS+, Seager 86, Gordon 79, Heredia 87. Got to watch a lot of the Tiebreaker games, and it was fun to watch outstanding teams go at it. These teams are brimming with good young players, and fantastic pitchers. Their talent base is clearly superior to the Mariners. The reason the M's plummetted back to the pack is this: They simply can't match up with teams like the Brewers, Cubs, Dodgers and Rockies, much less the teams who won their division outright. The Dodgers Buehler was a revelation. I'd never seen him before. So per DiPoto a full rebuild is not in the cards. He recognizes that four AL teams have a clear talent edge over the M's. Unstated but implied is that they block the M's way to being a regular factor in the playoffs. He is not content with just making the playoffs. He tried his best to put some lipstick on this pig, noting that after all they did still win 89 games, which in most seasons would make the playoffs. This year it took 98. My reaction? Looks like the M's are set to once again repeat one of their fundamental failures, spurning a teardown and moving forward with a perennial half-in-the-game roster and a limited ceiling. I hope I'm wrong. Then again one could argue that the one time in the last 17 years they actuall attempted a full rebuilt it went very badly, so perhaps mediocre is better than a failed rebuild. I dunno. The real truth is that we weren't that good. We can't win the division with Houston and Oakland configured as they are. And we are unlikely to be a Wild Card team next season, as things equalize. So you don't sign Cruz and play Healy (who OPSed .631 vL...there must be a bounceback there) and Vogs at 1B/DH. You have to play Vogelbach jusst so you can see what you have going forward. That is if you're satisfied that Cano has another 2B season in him. If not, I suppose we do trade Vogelbach for a RP. You have to decide if you're staying in on Gordon in CF, if you're moving Cano back to 2B. If there is a Gordon/Segura clash in the clubhouse, then I'm selling Gordon at the first opportunity. Heredia had 69 starts in CF and 19 in LF this season, vs. 53 and 50 last season. He went from a =0.5 dWAR guy to a -0.8 guy. I'm not a huge dWAR type, but I'm not into the Heredia is Paul Blair in CF vibe. And if he's not a delux bonus in CF, then he's not that valuable. We should have looked at Aplin and Miller this season and we should give both of them AND Bishop a real shot at the CF gig during ST next season. Seager was hurt this season, to some degree, but mostly it was the shift that crippled him. Leake and Marco have been great additions...now go get another. I would trade Gordon for a young arm , even a farm guy, in a heartbeat. Not that Morosi is a top-notch expert or anything, but his conclusion that the Mariners are "caught in the middle" between contending and rebuilding matches mine. What he doesn't mention is that they have been in this position pretty much ever since Lou left. The only exception is some of the Zduriencik years. That one rebuild effort failed. Why it failed can be debated, but results are results. This Ryan Divish article does a really nice job of analyzing DiPoto's comments. My concern is not that DiPoto is wrong in his analysis, I think he is. My concern is whey are we here...again? If someone tells me it's just bad luck I think I'll shoot the messenger. One other thing. This team was not an 89-win team. Of course it WAS in fact. But it was an 83-85-win team that played over it's head for the first month-plus. How about the Brewers' "Peralta" (of whom we will get to see much more in the playoffs). Struck out 13 in his MLB debut, at 22. For him, and two other high-potential pitchers from the Mariners' system, we got to enjoy a full season of Adam Lind. For me, the takeaway is "We can invest our future in lottery tickets, with remote possibilities of over-performing. But the teams that succeed year-after-year are not the ones with great eyes for lottery tickets, but the ones who do the best scouting (domestic., I ternational) and player development. Yeah. While the "mode" within which you decide to operate in any given season is important, a correct mode does not in itself insure success. You won't regularly succeed in any mode if you are not competent.